Fill out the QUICK & EASY Application below and one of our friendly representatives will contact you shortly! Q: What is Buy Here Pay Here (BHPH)? A: Buy Here Pay Here means that you can arrange a loan at the dealership and make your payments there. The payments come in form of bi-weekly installments. 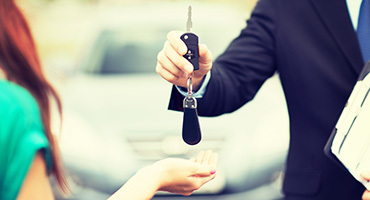 Q: Do prior repossessions, bankruptcy, bad/no credit or divorce effect my ability to buy a car? A: No. We are the bank, and your prior history makes no difference to us. Q: Do you report to credit agencies? A: We do not report to credit agencies. We will however at your request, provide a credit letter at the end of your loan providing proof of your overall payment history. This is a good way to improve your credit. Q: How much money down do I need? A: It depends on the type of vehicle you are interested in. The more money down the smaller your payments will be. Q: How long do I have to be on the job? A: We look for employment stability, but it varies for every customer. A: Valid driver's license, pay stub, proof of address, reference sheet with at least 6 names, and your downpayment.